The history of the Runnymede building is a colorful and interesting one which spans a time period of more than a century starting in Kansas in 1889, then being moved to Alva, Oklahoma Territory in 1893 only two months after the opening of the Cherokee Strip and Alva’s beginning as a town. The origin of the colony of Runnymede, Kansas was primarily due to the efforts of an Irish promoter named Edward Turnly whose family bought 1,700 acres of land in Harper County, Kansas at $1.50 an acre. Turnly soon founded the town of Runnymede which was located about 12 miles northeast of present day Harper, Kansas. Runnymede was named in honor of a historic spot in England near London where the Magna Carta was signed in 1215 by a reluctant King John giving Englishmen a so called bill of rights. 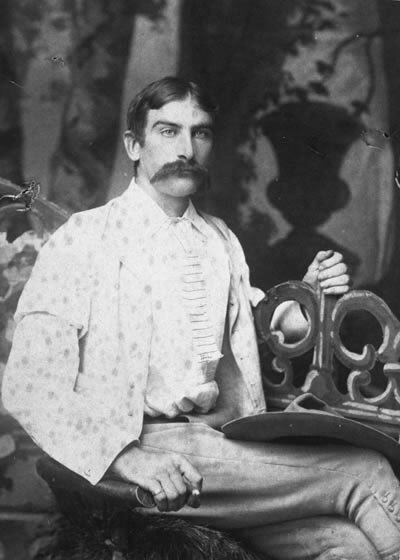 Turnly advertised in England that he was the lord of a western paradise in Kansas and that for $500 a year he would teach English gentlemen the skills of successful farming and livestock raising and provide for their physical needs. In 1888 Turnly and several recently arrived Britishers located a general store and post office in the town of Runnymede not far from the Kingman County line. Turnly's recruitment efforts were successful and some 100 English, Irish and Scots came to Kansas and joined his efforts. These men started businesses to sell groceries and dry goods built a creamery and livery stables for the care of horses; restaurants, a church and a stage line. The boys of Runnymede were often described as fun loving and frivolous, but irresponsible. They established courses for racing and steeple chasing, a polo field, a bowling alley, a billiard parlor, and tennis courts. Many horse races were held. They hunted coyotes like they had hunted foxes in England and even challenged a team from Wichita to a football game using English rugby rules. The men of Runnymede imagined they were in the very heart of the Wild West, wearing cowboy outfits and carrying an arsenal of guns and knives which rattled on them whenever they walked. They were armed to the teeth whenever they went outside of their homes. They proudly posed for pictures in photograph galleries or studios in Harper and Wichita. Runnymede had three elements which greatly appealed to the parents of these young men. It required a fee which was high enough to guarantee that no riff-raff would be admitted. It had a location in a state made famous for its prohibition laws, and the name of Runnymede which greatly appealed to the high born Englishmen's pride in their country. 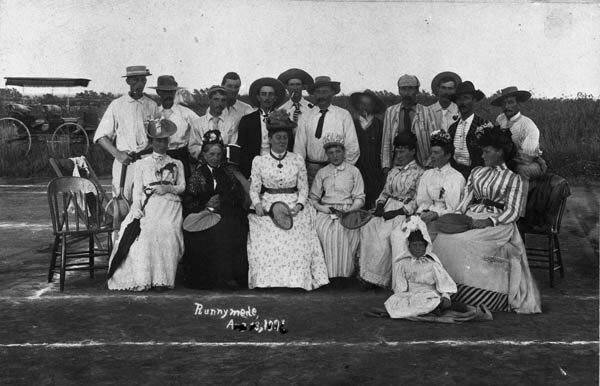 A group of Runnymede colony citizens posed at the tennis courts in 1891. Runnymede grew rapidly and by the end of 1889 buildings covered seven city blocks. The houses were mostly of the English mode with hedges of privet bought at a nearby nursery. The view of the country from the center of town was magnificent and the winding course of the Chicaskia River could be seen for miles. The town was surrounded by some of the most fertile land in Kansas. In September, 1889, the building of the Runnymede Hotel commenced and it was generally completed by December of the same year. It was easily the showplace of the town and of that section of Kansas. The hotel was a three story building with every accommodation for its guests. A grand banquet was held at the hotel on Christmas of 1890 attended by 38 people which was highlighted by a toast to the Success of Runnymede and a response by Ned Turnly who said that it showed what a few Englishmen by pluck and perseverance can do. 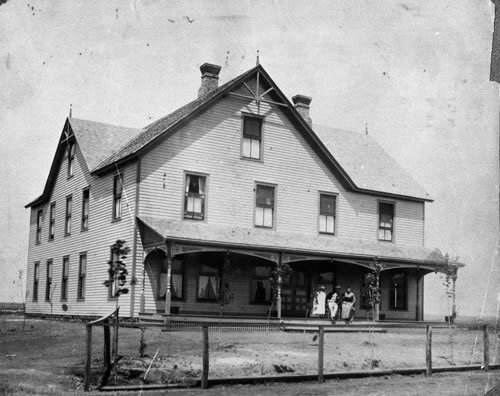 The editor of the Harper Sentinel newspaper visited the Runnymede and declared it well-built and arranged for accommodating the needs of the traveling public. The rooms were large and well arranged for heating and ventilation and were fitted with excellent water closets, wash rooms, closets and the like. He said that the hotel is the pride of Runnymede. A daily stage coach line was establis inhed with its headquarters at Runnymede and a run from there to Norwich and back by noon and to Harper and back by 7:00 in the evening. A tree nursery was started by Mr. Turnly and with the increasing population it soon became necessary to build a church in the town capable of holding 140 people, in February, 1890, the church was completed and it was one of the most compact and comfortable churches found anywhere. In 1891 the church was moved to Harper where it serves as a museum operated by the Runnymede Historical Society. On May 1, 1890, a fire burned the livery stable at Runnymede. Robert Watmough, a well known promoter and citizen of Runnymede, lost his life in the fire. It had been a difficult task saving the Runnymede Hotel from the fire and it was badly blistered by the heat. By July, 1890, however, the hotel was given a fresh coat of paint which greatly improved its appearance. In November, 1890, a large crowd from Harper went to the races at Runnymede. The town was dressed in its holiday clothes with both English and American flags displayed by the business houses. The afternoon was devoted to horse racing and a grand ball was held at the hotel in the evening. A reporter who visited the Runnymede Hotel during Christmas, 1890 concluded that the hotel was doing a thriving business and that both the buildings and inhabitants had doubled. The Runnymede Hotel as it appeared in Runnymede, Kansas. Hope and Constance Hooper, proprietors of the hotel can be seen on the porch. become suspicious of the manner of living practiced in Runnymede and refused to continue financing their offspring. A series of events beset the people of Runnymede and together caused its demise. The Englishmen were getting bored and British investment was falling off and the U.S. slid into a depression. Many of the colonists realized they would never become ranchers and began to go home. The final damaging blow came when the Kansas, Mexico, and Orient railroad failed to build a route to the town of Runnymede, but laid tracks two miles southwest of the town. By July, 1892 the Turnly real estate holdings in Runnymede were declared vacated for nonpayment of taxes. By the end of 1893, the experiment was over. The colonists had left and Turnly had gone back to Ireland with the money. A few of the buildings were moved to a new Runnymede located near the railroad crossing on the road to Harper. Little now remains of the original town of Runnymede. A wheat field now covers the area once occupied by the town. A Kansas historical marker located on a nearby highway commemorates the colorful British Runnymede which existed in 1888 to1892.